State officials announced this week that, due to investigations into Mayor Bill de Blasio’s alleged pay-to-play deals with developers, the two residential towers (which included a preschool and affordable housing) planned for the waterside park will not likely be moving forward. If the city has its way, though, the towers will move ahead. Empire State Development, New York State’s primary economic development agency, withdrew support for the agreement, citing potential issues with the developers of the apartment building. State officials noted that the lead developer, RAL Development Services, made a $10,000 contribution in May 2015 to the Campaign for One New York, a nonprofit that supports the mayor’s initiatives, like universal pre-K. RAL and co-developer Oliver’s Realty Group were selected from 14 proposals submitted to the Brooklyn Bridge Park Corporation, the nonprofit responsible for operating the park, at the end of last June. Jonah Bruno, a spokesman for Empire State Development, said: “We will not move forward with any changes until we are fully confident that all newly raised concerns have been addressed,” The Wall Street Journal reported. As early as late last week, state and city officials had reached an agreement for the space adjacent to the East River, despite an undercurrent of community opposition. It is possible that the deal can be salvaged if the community’s concerns around additional development in the park, and the main developer issue, can be resolved to the satisfaction of all stakeholders. Just hours later, however, The New York Times reported that the city intends to move ahead with the towers. “We’re going forward anyway,” said Alicia Glen, the deputy mayor for housing and economic development, to the Times on Tuesday. “We stand by the rationale for the project. It puts the park in a better position to address its maritime and capital needs. And we have an obligation to build affordable housing, particularly in these expensive and rapidly changing neighborhoods.” Glen is also chairwoman of the Brooklyn Bridge Park Corporation. The park is supposed to self-finance with development like the proposed towers: A 12-story building with 188 apartments (131 affordable) and a 26-story market-rate structure with of 116 condos, designed by ODA. The developer will pay the city $98 million, plus a small annual rent, for the privilege of building on the property. 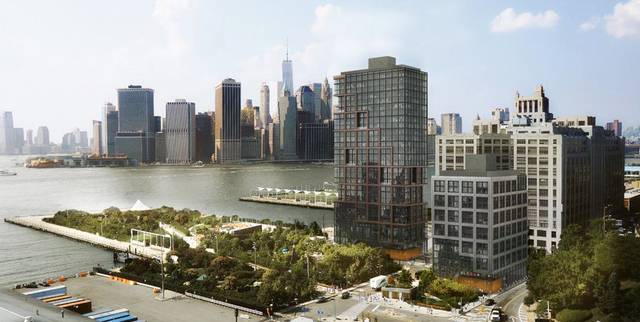 Councilman Stephen Levin and State Senator Daniel L. Squadron, two of the district’s representatives, note that to build on Pier 6, the city still needs state approval for the amendment to the project plan.